I’m Speaking at BlogHer 2014; Join Me! 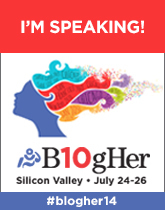 I am so excited to share that I will be a panelist/speaker at the 2014 BlogHer conference in San Jose, CA at the San Jose Convention Center on July 25th, 10:45a-12p. The session I am presenting is Writing Lab | Good to Great: Radically Improve a Blog Post in Real-Time . I will be speaking about storytelling through blogging. If you have been following my blog, you know that storytelling is what I was born to do. I hope you will join me at this dynamic event for women bloggers. If you have ever wanted to blog, but didn’t know how, or want to take your blog to the next level, then you MUST be at the 2014 BlogHer conference. Registration is now open at http://www.eventbrite.com/e/blogher-14-registration-4010986970. This entry was posted in education, empowerment, entrepreneur, inspiration, leadership and tagged blogging, BlogHer, creative writing, inspiration, storytelling, women, writing. Bookmark the permalink.